One of the longest lasting settlements on the coast is Smuggler's Rest. The native Modai'I name is too difficult and long to pronounce so the moniker stuck with outlanders who chose to make it their home or at least stop by. Smuggler's Rest, hardly more than a shanty town, is a place where vagabonds, silt pirates, waste raiders and other miscreants can live their lives far from the prying eyes of the Templars. Few this far out have ever been to a city and most like it that way. 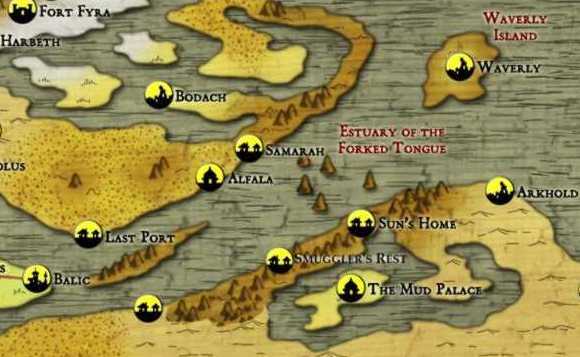 Many are either on the run from the agents of the city-states or the established merchant houses; life on the southern coast of the Estuary of the Forked Tongue offers anonymity and seclusion from the Tablelands. Smuggler's rest has another side other than the seedy silt side. Due to its location to several known ancient ruins many in search of treasure, history, and other lore frequent the town to trade knowledge and set out on expeditions. The Modai'I and their silt spirits control the bay that Smuggler's Rest sits on. This strange tribe trades with silt wading giants, pirates, or anyone with an interest in the Sea of Silt. The Modai'I town proper sits just to the east of Smuggler's Rest. Outlanders are allowed to come into the town but they are not allowed to own property and are only allowed to stay within the adobe walls if they are vouched for and given a shelter by a Modai'I. The Modai'I believe that everything has a spirit that is to be respected and that the Sea of Silt has the greatest spirit of all. As such they try to be like the silt in many aspects of their culture and personal lives. Many neighboring tribes have all been subjugated by the constant encroachment of the silt worshipers. Tribute is given and when it is not war bands are called up to quell the upstarts. Recently a sacred ground of the Modai'I and neighboring tribes has been taken over and turned into an armed encampment by a foreign legion. They have rebuffed all attempts by local tribes to kick them off the land due to the defensive nature of the site, which the locals call Sun's Home . Rumors abound about the Modai'I mobilizing to remove this threat to their power, but they have not acted as of yet. What has brought you through the wastes to Smuggler's Rest?